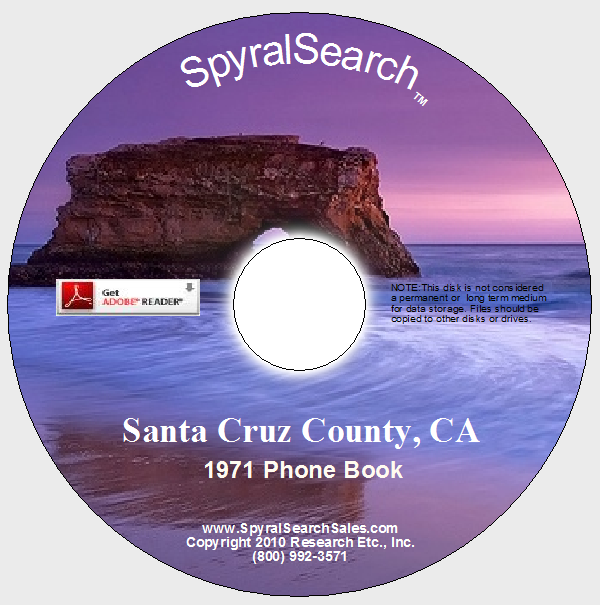 "Spyral" back in time to capture records of people and their lives in past years. of the actual pages, plus the entire contents are fully text searchable by keywords. After purchasing & selecting "Download" as your shipping option, you will receive an email with a custom link to the directory you purchased. Open the link, click "download" & save to your desktop - no shipping charges & get it within the hour. Don't see the City/Year you are looking for? Click here to view the list of phone books not yet scanned that are available as Pre-orders. NOTE: Reverse Telephone & Address Indexes are not always present in old phone books, however you may use the Adobe® Reader® search tool to find any individual, even by their first name, living on a certain street, or with the same telephone number, etc. Reference Resource for Time & Place: Many times an investigator searches the Internet for references to certain records only to find that they are from the 1700’s or 1800’s. These types of records are virtually useless for the searcher whose investigation starts in the 1960’s! 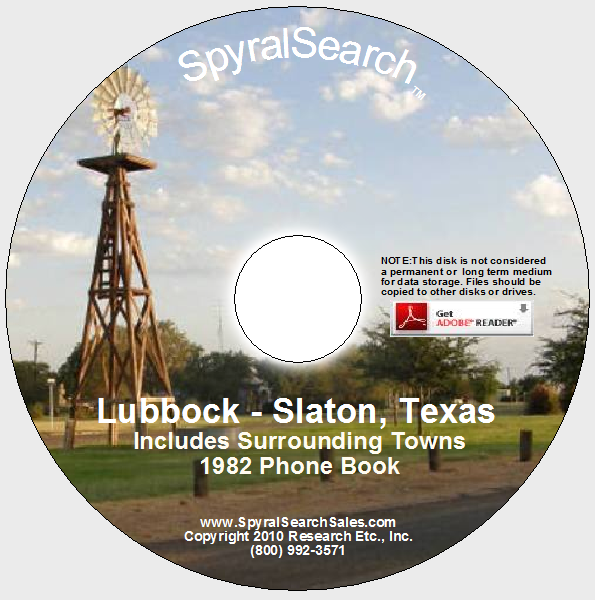 SpyralSearch can provide the records you want and need from the recent past. Family Ties & Genealogy: Our City Directories will enable you to see the individuals with the same last name that may meet your criteria – single, married, occupation, etc. and also names of other family members, residing in the household. For example, you know that in 1960 “Unknown” Smith was a college student living at home with her parents in El Paso, that her father was a carpenter, and her mother was an accountant. Your search criteria would pull up all “Smith’s” in the 1961 El Paso Directory, and you could possibly identify the right family, and acquire the first names of the college student and her parents, enabling you to locate them currently. If your search subject has a common first and last name, a City Directory can provide a middle initial and help narrow down your list. Genealogists, Searchers, and Investigators are the modern day Historians, and have long known the wealth of information found in old City Directories and Phone Books to find clues and links to persons and places of a past time period. 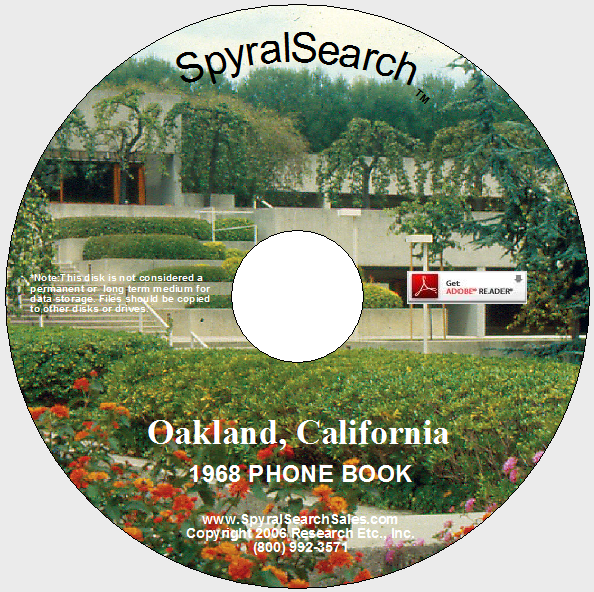 Accessing the information in these directories used to involve trips or letters to the libraries, but now SpyralSearch has made it possible to do research in your own home or office by having the directory information on CD's. Tremendous Search Tool: As investigators of all types know, it is often necessary to go backward into the past in order to get vital information that will enable you to come forward to the present. While there are many reputable data providers out there offering current information on individuals or businesses, you must be able to provide correct information to search. The older information can be so important to gain a “starting place” in your search in order to then come forward to locate your subject currently. Features: High quality - 300 dpi resolution of original pages in pdf format. Old reference sources are maximized beyond their original value and have been transformed into powerful research tools with endless search capabilties. You can have this unique resource available on your own computer and avoid trips and calls for lookups at the library. Old directories and telephone books have been scanned, page by page onto cd's so you can review the actual copy of the directory. But better yet - all the text is fully searchable by keywords such as name, occupation, business, street name, address, phone number, etc. using the search feature in Adobe® Reader®. Cushing Forensic Genealogy has donated Jerry's entire collection of old phone books and city directories to SpyralSearch. We have many of these books already processed and available as CD's or downloads. successful in locating thousands of heirs entitled to millions of dollars. 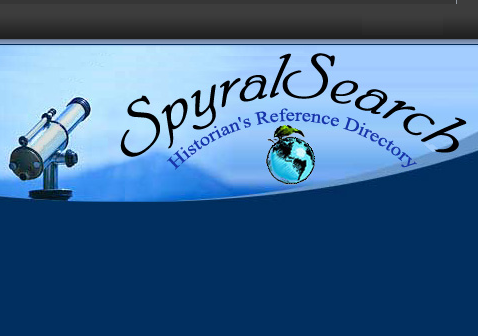 Research Etc., Inc. is the parent company of SpyralSearch, LLC and Research Etc. Publishing, the two companies that produce and provide the CD & DVD products that are available on this site. Research Etc., Inc. is a licensed Private Investigations Agency and has been in business for 18 years, specializing in Adoption Searches, People Locate Services, and Pre-Employment Screening for individuals and businesses nationwide. They also provide Birthline Registry® for all adoption triad members seeking birth family members.